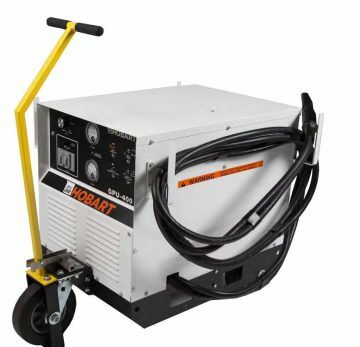 The Hobart GPU 400 and GPU 600 Solid State ground power units provide precisely regulated 28.5 volt DC service. These reliable solid state GPU’s are equipped with “soft Starting mode for engine starting recommended by most airframe manufacturers. Specifically developed in response to customer needs, the GPU-400 and GPU 600 supply the fully regulated, dependable power required by today’s more demanding aircraft. The GPU-400 delivers 400 amps continuous to 1600 amps peak for engine starting. The GPU-600 delivers 600 amps continuous to 2000 amps peak for starting. The Hobart GPU 400 and GPU 600 are made for use with all three phase 50/60Hz power. Supply voltage, 3 phase, re-connectable, varies by model.